Are you interested in buying an aboveground or an inground swimming pool? If so, you should make another purchase as well. That purchase is a safety fence. Many states have strict safety fence requirements. 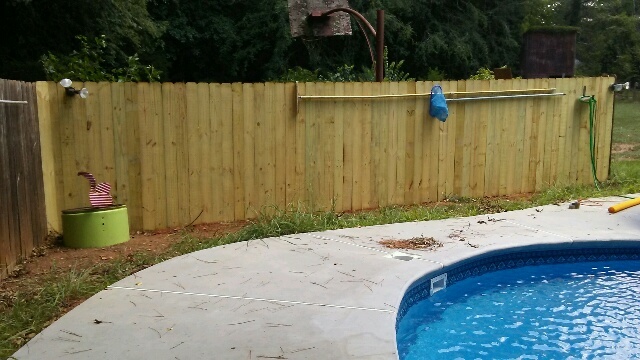 With that said, even if your state doesn’t, there are a number of benefits to installing a fence around your swimming pool. As previously stated, there are a number of benefits to the installation and use of a pool fence. One of those benefits is safety. If you are the parent of a young child, it is important to remember that some kids are like magicians. Even when in a well-supervised environment, they can often find a way to disappear. A fence can help to ensure that your child isn’t found in your swimming pool. A pool fence can also help to reduce liability. Even if you aren’t a parent, take a close look at your neighborhood. Are there kids around? If so, you should know that pools are attractive to children. A pool fence can help to protect you, as well as a neighborhood kid that may venture onto your property. You are less likely to be held liable for a pool accident when you can prove that you did take the proper precautions. Now that you know just a few of the many benefits to outfitting your swimming pool area with a safety fence, you may be curious as to how you can get started. You will first want to familiarize yourself with your buying options. You may be surprised how many different fence styles are currently available for sale. These styles include wood, metal, and mesh. For décor purposes, wood comes highly rated and recommended. Do you take pride in your property? If so, wood may be the best option for you. A wood fence will look nice when surrounded by small bushes or garden flowers. In terms of safety, wood fences are usually harder to climb. As for installation, if you opt for a wood fence, you will likely have to build the fence yourself. Precut pieces can be found or custom cut at one of your local home improvement stores. For safe installation, be sure to purchase a guide on building fences or at least use the internet to find detailed directions. It is not uncommon to find metal, wrought iron, and aluminum fences grouped into the same category. This is due to the closeness in appearance. Although aluminum fences are cheaper and durable, wrought iron fences come highly rated and recommended. When choosing a metal, wrought iron, or aluminum fence style, it is important to examine ease of climbing. Often times, the decorative fences are easier to climb, as they tend to have décor that can be used as a guide. For example, a horizontal bar on the base of the fence as well as one at the top can make it very easy for someone, even a child, to scale the fence. Mesh pool fences, another one of your options, are increasing in popularity. They are recommended for inground pools. This is due in part to the concrete surrounding the pool. Most mesh fences use this concrete as an anchor. It also helps to stabilize the fence. What is unique about mesh fences is that they are easy to remove. In fact, they are also commonly referred to and sold as removable fences. Removable fences are recommended if you foresee a renovation in your future. Would you like to build a pool house? Would you like to add more patio space to your pool area? If your answer is yes, you can easily do so. Mesh fences are easy to install, take down, add on other sections, and close back up. As you can see, you have a number of different pool safety fence buying options. Whichever style you decide on, purchase a fence that is at least four feet high. You may want to consult with local government officials before making your purchase. Thanks for this advice for buying a pool safety fence. I didn’t know that if you are picking a metal fence you need to think about how to make it not climbable. I wonder if it could be good to work with the fence company to come up with a good design.